Your guests won’t know if they’re enjoying dessert or a sweet + savory side dish with this meringue-topped sweet potato casserole. The perfect elevated side dish for your Thanksgiving menu. 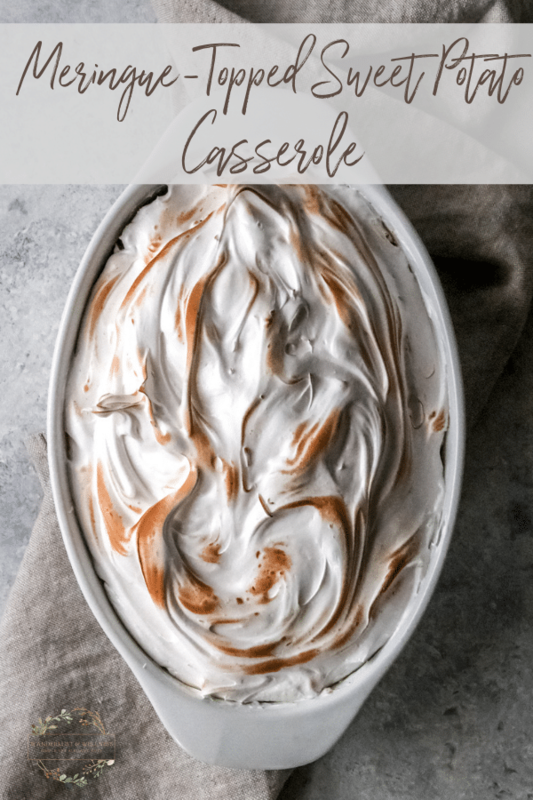 Don’t let the meringue topping scare you off from making this meringue-topped sweet potato casserole for your upcoming holiday dinners. Of course, you can enjoy this dish for any occasion, but it will knock the socks off your dinner guests. Meringue might seem like a complicated element, but I assure you this is a simple yet elegant dish to prepare. 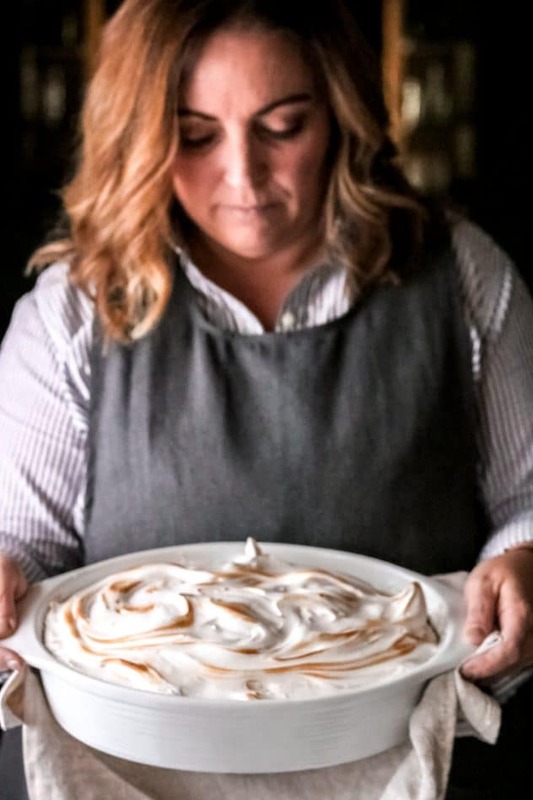 The meringue makes this dish elegant and beautiful, but let’s talk about what’s under the meringue. 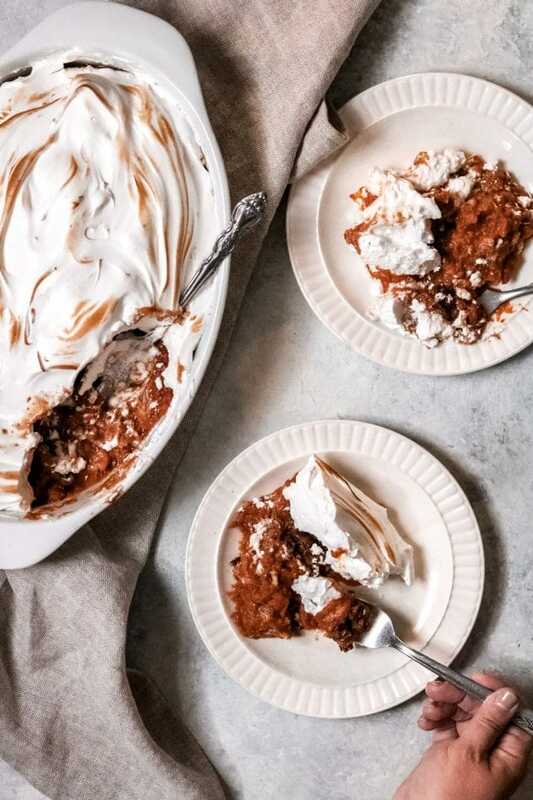 For this meringue-topped sweet potato casserole, you’ll make a simple sweet potato purée, sweetened with maple syrup and enhanced with pumpkin pie spice. The secret ingredient is the salt, because it comes to light with each bite, balancing out that sweetness. On top of the sweet potato purée is a layer of pecan crumble. Then, you’ll top it all with a hefty layer of meringue. 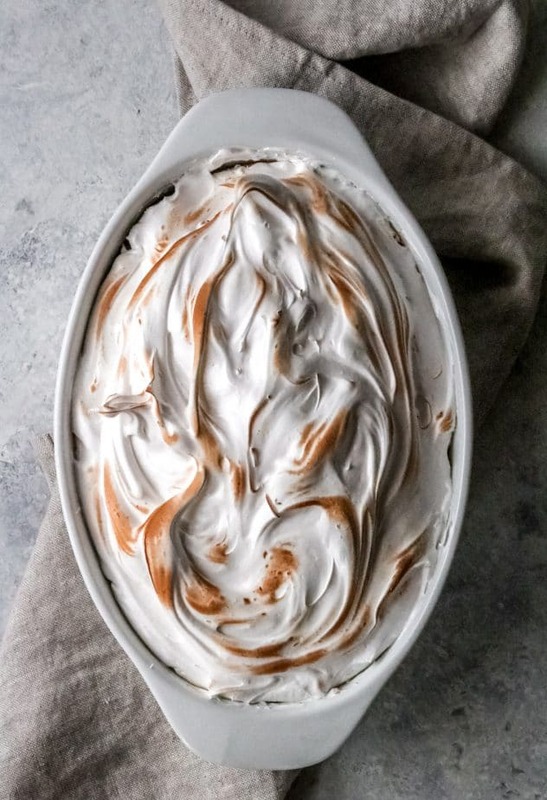 To get that nice toast on top of the meringue, you can use a small kitchen torch, but if you don’t have one available you can also just stick it under the broiler for about a minute. Your guests will fall in love with this dish. My daughter legit thought it was pumpkin pie (which she loves) until I told her it was actually made from sweet potatoes (which she despises), so needless to say she approved even though she would have never eaten it had she known it was sweet potato casserole. Enjoy this simple yet elegant dish this holiday season, and be sure to let me know if your guests enjoyed it as much as mine did! 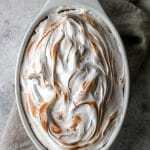 Elevate your Thanksgiving menu with this meringue-topped sweet potato casserole. Place sweet potatoes onto a baking sheet. Using a fork, prick each potato several times all over. Bake for 1 – 1 1/2 hours or until very soft. Remove from oven and let cool. Once sweet potatoes are cooled, scoop out the flesh and add to a mixing bowl. Mix with your stand mixer or hand mixer on low until puréed. Add the butter, maple syrup, pumpkin pie spice, and salt, mix on low until well combined. Grease a 9×13 baking dish. Transfer the sweet potato purée from the mixing bowl to the greased baking dish. Prepare the pecan crumble topping. In a medium bowl, combine the melted butter, brown sugar, flour, cinnamon, salt, and pecans. Stir until thoroughly combined. Spread the pecan crumble across the top of the sweet potato purée. Place baking dish into the oven and bake for 15 minutes. While the dish is baking, begin to make the meringue. In a mixing bowl, add the egg whites, cream of tartar, and salt. 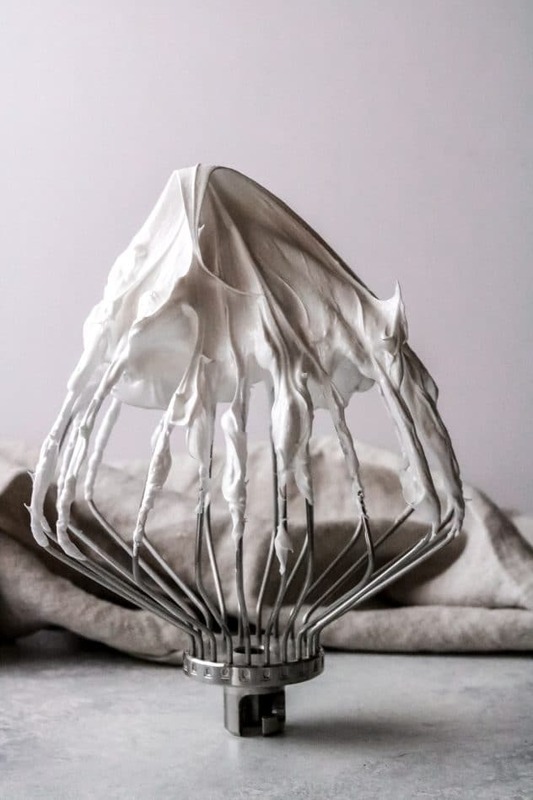 Using the whisk attachment (if using a stand mixer), begin beating on low speed, for about 30 seconds. Then, begin to increase the speed to high and continue beating until soft peaks begin to form. Next, gradually begin adding the sugar as it continues to beat on high. Continue beating until thick and peaks begin to form. 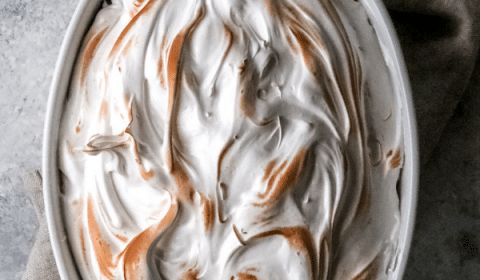 The meringue should be glossy. Set aside until potatoes are ready. Once the sweet potato casserole is finished baking, remove from oven. Spoon the meringue over the purée, spreading it evenly. Using a small kitchen torch, brown the edges of the meringue. If you do not have a kitchen torch, you can place the dish under the broiler on the top shelf for about one minute.